Italy is and has always been our No. 1 most requested destination at Ciao Bambino, and for good reason! Not only do Italians adore children of all ages, the country is stuffed with more ancient ruins, glorious landscapes and cultural masterpieces than you could experience in several decades’ worth of travel (and that’s not even counting the food). It’s this wealth of choice that can make planning a family vacation here feel daunting … with so many possibilities, how can you figure out the best places to go in Italy and distill them into a week or even two? It’s not often you get access to such amazing family travel advice from an insider. Don’t pass up the chance! 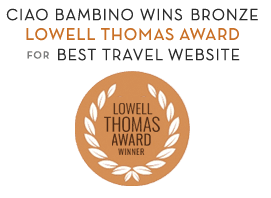 Ciao Bambino’s Italy planners can work with you one on one to book vetted kid-friendly accommodations, craft a custom itinerary that’s tailored to your needs and interests, arrange private guides and activities, and more. Reach out via our contact form, and a member of our Family Vacation Advisor Team will follow up directly. Follow us on Facebook for the latest Italy content, from live videos to destination and accommodations reviews! I loved listening to your Italian experience with kids. I am sure you can help me. I am bringing my 14 year old grandson to Italy in July. You are so right. I do not want to drag him around. I have our first 3 night in Rome, arriving early Saturday am and staying in Trastevere. I am looking for suggestions. I know I would like him to see the Vatican and would like to buy a tour with a guide who appreciates a kid who is excited by architecture and mythology. I saw a Gladiator school which could be a fun experience and I love a guide for the coliseum who you could hopefully recommend. From there I was hoping to take the train to Florence and I would love a guide and a recommended hotel. (I will not have a car) I love the idea of Tuscan countryside for those nights and would need recommended places available to public transportation. Olive/wine farm tour was fun for my 14 yo granddaughter a couple of years ago. ,Our Monday 31 early am flight is out of Rome returning to NYC. Is the beach you mentioned available on the weekend before we leave or I am open, I thought we would end up in Rome but maybe better to extend the Tuscan area where he could bicycle saftely. I am a little, a lot rusty ,but he does bike in NYC. Typically, how long does it take for a travel advisor to get back to you? I submitted a form last week and haven’t heard anything yet. I just filled out the form again today. We will be outside of Florence for two weeks in August and I want to make sure we plans some activities and get some kid friendly tour guides before they are all booked up. Thanks! Hi Jennifer! Thank you for submitting a second request. We private messaged you on 6/12 and today. Please check your spam folder for any messages from Ciao Bambino. Sorry for the delay. Happy travels! Hi Nicola – We’ll be happy to help you narrow down the choices and plan the rest of your trip! One of our Family Vacation Advisors specializing in Italy will reach out in email to talk about next steps. Happy travels! My husband, my two children (8 and 4) will be in Italy in July. My husband is a native of Tuscany, so we have 4 to 5 days of family time before we join his family in Montepulciano. We would like to take the children somewhere they have not been – any suggestions that are fairly close to Rome. Hi Victoria, that sounds wonderful! We can certainly help – I’ll have a Family Travel Advisor reach out in email. Happy planning! We are planning to visit Italy next year over the Christmas holiday with our 5 year old son. We will be visiting my sister who will be studying in Bologna but we are undecided as to staying in Bologna or visiting somewhere a little warmer in the Southern region. Where would you recommend for a family to visit in Italy during Christmas? Hi Danielle – Italy is lovely at Christmastime and there are so many possibilities…I’ll have one of our Family Travel Advisors reach out via email to talk more about our planning service and how we can help. Best of luck with your travels!